For other uses, see Gāndhārī. Gāndhārī is a modern name (first used by scholar Harold Walter Bailey in 1946) for the language of Kharoṣṭhi texts dating to between the 3rd century BCE and 4th century CE found in the northwestern region of Gandhāra, but it was also heavily used in Central Asia and even appears in inscriptions in Luoyang and Anyang. Gandhari is descended from Vedic Sanskrit or a closely related language. The Gandhari Prakrit appears on coins, inscriptions and texts, notably the Gandhāran Buddhist texts. It is notable among the Prakrits for having some archaic phonology (some being characteristic of the Dardic languages of the modern region), for its relative isolation and independence, for being partially within the influence of the ancient Near East and Mediterranean and for its use of the Kharoṣṭhī script, a unique sister to the Brahmic scripts used by other Prakrits. Gandhari is a late Middle Indo-Aryan language - a Prakrit - with unique features that distinguish it from all other known Prakrits. Phonetically, it maintained all three Old Indo-Iranian sibilants - s, ś and ṣ - as distinct sounds where they fell together as [s] in other Prakrits, a change that is considered one of the earliest Middle Indo-Aryan shifts. Gandhari also preserves certain Old Indo-Aryan consonant clusters, mostly those involving v and r. In addition, intervocalic Old Indo-Aryan th and dh are written early on with a special letter (noted by scholars as an underlined s) which later is used interchangeably with s, suggesting an early change to a sound, likely the voiced dental fricative ð, and a later shift to z and then a plain s. The Middle Prakrits typically weakened th to dh, which later shifted to h. The Kharosthi script does not render the distinction between short and long vowels, so the details of that feature are not known. In general terms, Gandhari is a Middle Prakrit, a term for middle-stage Middle Indo-Aryan languages. It only begins to show the characteristics of the Late Prakrits in the 1st century of the Common Era. The Middle Prakrit phonetic features are the weakening of intervocalic consonants: degemination and voicing, such as the shift of OIA k to g. The most rapid loss was the dentals, which started to disappear completely even before the late period as with t > 0 as in *pitar > piu; in contrast, retroflex consonants were never lost. There is also evidence of the loss of a distinction between aspirates and plain stops as well, which is unusual in the Indo-Aryan languages. In Central Asian Gandhari, there is often confusion in writing nasals with homorganic stops; it is unclear if this might represent assimilation of the stop or the appearance of prenasalized consonants to the phonetic inventory. Gandhari grammar is difficult to analyse; endings were eroded not only by the loss of final consonants and cluster simplification of all Prakrits but also by the apparent weakening of final vowels "'to the point that they were no longer differentiated'". Nonetheless, there was still at least a rudimentary system of grammatical case. Verbal forms are highly restricted in usage due to the primary usage of longer texts to translations of religious documents and the narrative nature of the sutras but seem to parallel changes in other Prakrits. The lexicon of Gandhari is also limited by its textual usage; it is still possible to determine unusual forms, such as Gandhari forms that show commonalities with forms in modern Indo-Iranian languages of the area, notably Dardic. An example is the word for sister, which is a descendent of Old Indo-Aryan svasṛ- as in the Dardic languages, whereas all the Indo-Aryan languages have replaced that term with reflexes of bhaginī. Initial identification of a distinct language occurred through study of one of the Buddhist āgamas, the Dīrghāgama, which had been translated into Chinese by Buddhayaśas (Chinese: 佛陀耶舍) and Zhu Fonian (Chinese: 竺佛念). The now dominant hypothesis on the propagation of Buddhism in Central Asia goes back to 1932 when E. Waldschmidt remarked that the names quoted in the Chinese Dīrghāgama (T. 1), which had been translated by the avowedly Dharmaguptaka monk Buddhayaśas (who also translated the Dharmaguptakavinaya), were not rendered from Sanskrit, but from a then undetermined Prākrit also found in the Khotan Dharmapada. In 1946, Bailey identified this Prākrit, which he named Gāndhārī, as corresponding to the language of most Kharoṣṭhī inscriptions from Northwestern India. Since this time, a consensus has grown in scholarship which sees the first wave of Buddhist missionary work as associated with Gāndhārī and the Kharoṣṭhī script, and tentatively with the Dharmaguptaka sect. Available evidence also indicates that the first Buddhist missions to Khotan were carried out by the Dharmaguptaka sect, and used a Kharoṣṭhī-written Gāndhārī. However, there is evidence that other sects and traditions of Buddhism also used Gāndhārī, and evidence that the Dharmaguptaka sect also used Sanskrit at times. It is true that most manuscripts in Gāndhārī belong to the Dharmaguptakas, but virtually all schools — inclusive Mahāyāna — used some Gāndhārī. Von Hinüber (1982b and 1983) has pointed out incompletely Sanskritised Gāndhārī words in works heretofore ascribed to the Sarvāstivādins and drew the conclusion that either the sectarian attribution had to be revised, or the tacit dogma "Gāndhārī equals Dharmaguptaka" is wrong. Conversely, Dharmaguptakas also resorted to Sanskrit. Starting in the first century of the common era, there was a large trend toward a type of Gāndhārī which was heavily Sanskritized. 29 fragments of birch-bark scrolls of British Library collection consisting of parts of the Dharmapada, Anavatapta Gāthā, the Rhinoceros Sūtra, Sangitiparyaya and a collection of sutras from the Ekottara Āgama. 129 fragments of palm leaf folios of Schøyen Collection, 27 fragments of palm-leaf folios of Hirayama collection and 18 fragments of palm leaf folios of Hayashidera collection consisting of the Mahāyāna Mahāparinirvāṇa Sūtra and the Bhadrakalpikā Sūtra. 24 birch-bark scrolls of Senior collection consists of mostly different sutras and the Anavatapta Gāthā. 8 fragments of a single birch-bark scroll and 2 small fragments of another scroll of University of Washington collection consisting of probably an Abhidharma text or other scholastic commentaries. 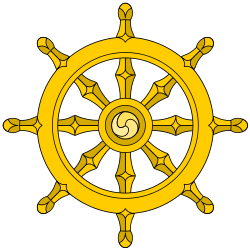 Mahayana Buddhist Pure Land sūtras were brought from the Gandhara region to China as early as 147 CE, when the Kushan bhikkhu Lokakṣema began translating the first Buddhist sūtras into Chinese. The earliest of these translations show evidence of having been translated from Gāndhārī. It is also known that manuscripts in the Kharoṣṭhī script existed in China during this period. Some scholars believe that the importance of Gāndhārī in Central Asia is out of proportion with the relatively small number of surviving documents which have been discovered so far. ↑ Masica 1993, p. 169. ↑ Barnard 1999, p. 110. ↑ Barnard 1999, p. 121. ↑ Masica 1993, p. 180. ↑ Barnard 1999, p. 124. ↑ Barnard 1999, p. 125. ↑ Barnard 1999, p. 125-6. ↑ Barnard 1999, p. 127. ↑ Barnard 1999, p. 129. ↑ Barnard 1999, p. 130. ↑ Barnard 1999, p. 132. ↑ Barnard 1999, p. 133. ↑ Barnard 1999, p. 134. 1 2 Bumbacher 2007, p. 97. ↑ Bumbacher 2007, p. 98. 1 2 Bumbacher 2007, p. 99. Heirman, Ann; Bumbacher, Stephan Peter (2007). The Spread of Buddhism. Brill. ISBN 978-90-474-2006-4. Salomon, Richard; Allchin, Raymond; Barnard, Mark (1999). Ancient Buddhist Scrolls from Gandhāra: The British Library Kharoṣṭhī Fragments. University of Washington Press. ISBN 978-0-295-97769-0. Salomon, Richard (2006). Patrick Olivelle, ed. Between the Empires : Society in India 300 BCE to 400 CE: Society in India 300 BCE to 400 CE. Oxford University Press USA. ISBN 978-0-19-977507-1.